MONTEREY — Monterey Peninsula Buddhist Temple proudly presents for the first time on the Monterey Peninsula, Hawaii band Kalapana, which will perform Friday, Oct. 6, at 7 p.m. at the Golden State Theatre in downtown Monterey. 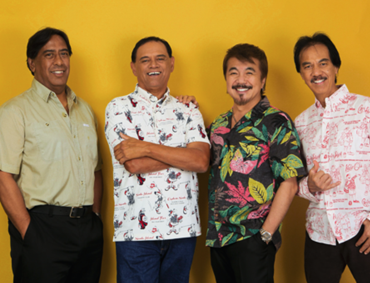 Kalapana emerged as one of the most popular bands on the Hawaiian music scene in the ’70s, producing a steady stream of hits. Their 1975 debut album was hailed as one of the best of the mid-’70s Hawaiian renaissance. Tracks like “Naturally,” “Nightbird,” “The Hurt,” “You Make It Hard,” and “When the Morning Comes” became household tunes and still enjoy frequent play on contemporary Hawaiian radio. Performing as Kalapana: Malani Bilyeu (vocals, guitar), DJ Pratt (lead guitar, vocals), Gaylord Holomalia (keyboards, vocals), and Kenji Sano (bass, vocals); accompanied by Garin Poliahu (drums) and John Valentine (vocals, guitar). Michael Paulo will also be performing with Kalapana as a special guest on the saxophone. One of the most versatile and cosmopolitan saxophonists in pop, soul and contemporary jazz for nearly 35 years, Paulo has added his distinct saxpertise to a virtual who’s who of artists, including Al Jarreau (Paulo’s longest-term touring association), James Ingram, No. 1 smooth jazz trumpeter and guitarist Rick Braun and Peter White, Oleta Adams, Kenny Loggins, Patti Austin, Jeffrey Osborne, Jeff Lorber, David Benoit, Carl Anderson, Bobby Caldwell, Johnny Mathis and more. Monterey Buddhist Temple’s history began over 80 years ago. It wasn’t until after World War II that regular services and activities were held at the JACL Hall on Adams Street in Monterey. In 1958, the lot on Noche Buena was purchased, and the temple was completed in 1965. The Japanese garden surrounding the temple was landscaped entirely by the members; the garden took eight months to complete. In 1976, disaster struck. One of the biggest fires in Seaside history completely destroyed the temple. When news of the misfortune spread, contributions came from every part of the country. Monterey Peninsula Buddhist Temple was rebuilt and rededicated in June 1977, 17 months after the fire. Annually, the temple hosts the Obon Festival – thousands of people attend a day of Japanese foods, taiko, martial arts demonstrations, and dancing to celebrate family and ancestors. Currently, services are held Sunday morning and are open to the public. For more information, visit https://montereybuddhist.org/.